We use Pleasant Holidays to book our clients travel package to Hawaii. Pleasant does more travel to Hawaii than any other provider. This size gives our clients both excellent pricing and many choices. These are travel packages that Air, Room and Car rental with all taxes included. But our real advantage is knowledge of the Hawaiian Islands. 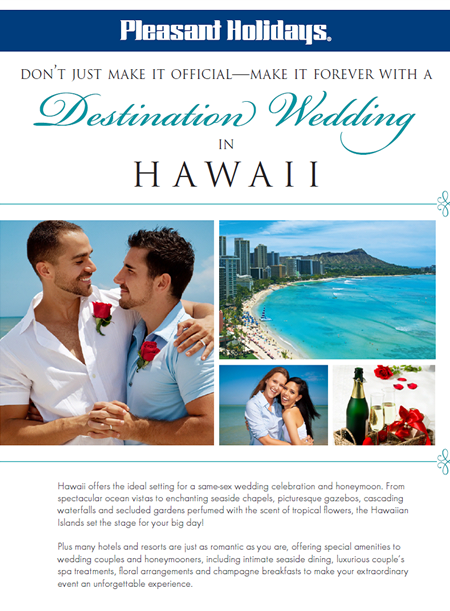 Owner of Hawaiian Style Gay Weddings Mark Steffan has lived on Oahu and Maui and spent extensive time on Kauai and the Big Island of Hawaii. He knows the resorts and the locations. Location is very important in choosing where to stay. See more on the different Hawiian Islands on our locations page. Each Island has its own micro climate. ark can tell you where it might be more rainy at certain times of year. He has stayed at many of the resorts and knows many of them well. He will tell you his favorites and give you options on many more. The resorts range from 1 star to over 5 stars. He can show you resort hotels as well as resort condo’s. Some clients like the condo option as they will usually have a full kitchen and a separate bedroom. Larger condo’s will fit small groups. The one thing Mark is often asked about is an all inclusive resort. Unfortunately their are non anywhere in the Hawaiian Islands. But with our discount activity program he can create a modified all inclusive that would include everything but your meals. Yet some of the larger resorts will include a breakfast in their rates. For best help call Mark Steffan on his cell phone at 808-268-8339.